Commissioner Chloe Eudaly and about 20 to 30 workers distributed door-hangers in East Portland. They still showed up to get the vote out — yet the East Portland effort nearly marooned Chloe Eudaly as the only commissioner to prominently support the idea that government employees can advocate for voting while on the clock. Mayor Ted Wheeler and City Auditor Mary Hull Caballero instructed the workers they oversee to request time off for the election drive at the eleventh hour, joining previous holdouts Commissioners Amanda Fritz and Nick Fish. 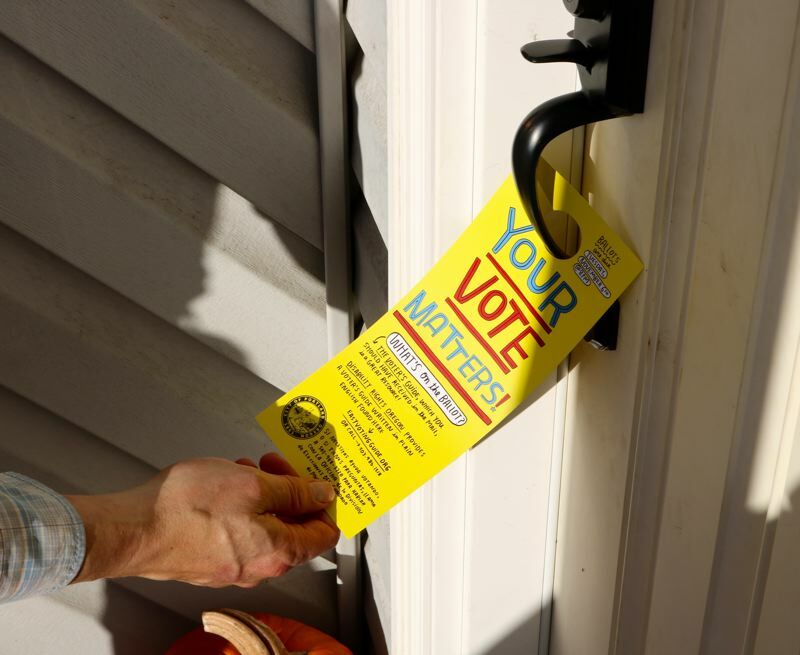 In the end, only about 25 or 30 people distributed the bright yellow door-hangers during a house-to-house march on Friday, Nov. 2. A 2:30 p.m. kick-off rally at City Hall was canceled in favor of a gathering at the East Portland Community Office, 1017 N.E. 117th Ave. In a text message statement, Eudaly thanked her staff and other government employees for taking up arms against a "vicious cycle" of low participation at the ballot box. "Low voter turnout leads to less representation, less investment and fewer services," she said. "While the City of Portland is investing more than ever in East Portland, we still have a long way to go with civic engagement. I consider this the job of every bureau." 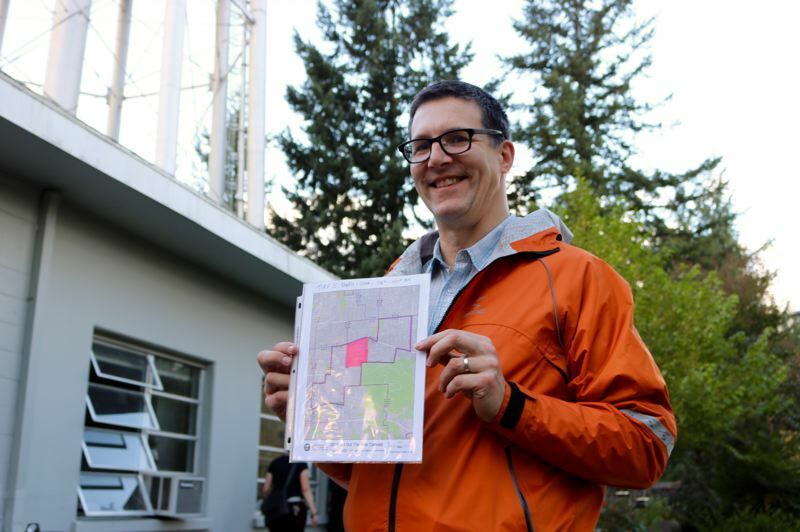 The Tribune tagged along with Eudaly's chief of staff, Marshall Runkel, his wife Melissa Favara and daughter Ramona Runkel as they tramped along where the sidewalk ends — Southeast 136th Avenue. Runkel reported that he passed two gentleman's clubs while walking the Powellhurst-Gilbert area — but also petted three "really nice" dogs and two "really cute" cats. "Honestly, this was about helping neighborhoods that are struggling neighborhoods do a better job of advocating for themselves," he said. But in an indication of the tenuous tightrope between non-partisan advocacy and blatant electioneering, Runkel declined to elaborate on the matter. "I'm on city time, I can't characterize one political party or another's motive, so I'm not going to do it," Runkel noted. "You can determine by science which areas of the city are least likely to vote. So we went to those areas with a reminder to vote. It's not rocket science." He said Eudaly was a "little disappointed" that the other four on the dais yanked their support for the initiative, which took place in voting precincts 5102, 5101, 4710, 4804 and 4805. Runkel said the Office of Civic & Community Life has adopted voter turnout as a metric to measure a neighborhood's health and well-being. He hopes the drive will continue during the next city-wide election, but says Eudaly's office wants to be in the background of that effort because the Commissioner will be up for reelection. "It was a great day. I was happy to be out and encouraging people to vote," Barber said. "We had great weather. I was happy for that."